Some of the best Thanksgiving math activities have to do with cooking. Creating a Thanksgiving meal involves important math skills such as grouping, measuring, patterns and arithmetic. 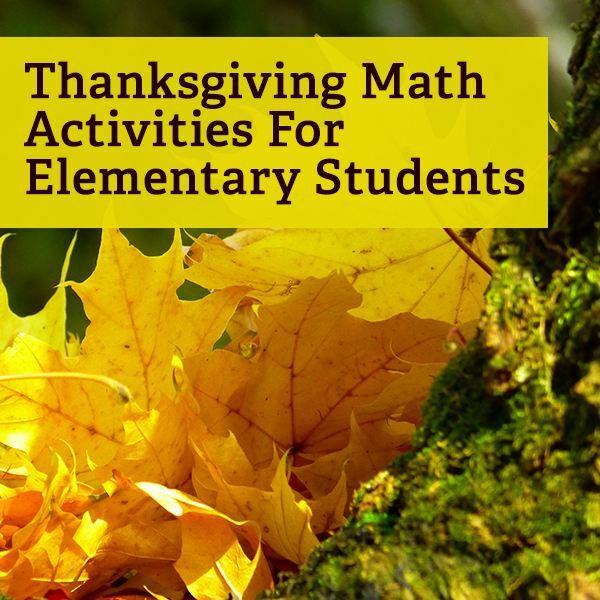 Not only do these math activities help your child to brush up on their math skills, but they also make them feel important as they help prepare the Thanksgiving meal. Use the tips below to help your child practice their math skills. Have students help you decide how big a Turkey you should buy based on how many people are attending dinner. Assume each person will need 1 lb. of turkey. Bring an assortment of measuring cups into school. Have students do some measuring with you to get a better understanding of how fractions work. Have students plan a pretend Thanksgiving dinner using the instructions below. This is a great way for students to practice their arithmetic skills! Have each student write down the items they would have at a Thanksgiving dinner. Some of the included items may be turkey, ham, corn, mashed potatoes, sweet potatoes, rolls, pie, cake and gravy. Now have students make a list of the people they would invite to their Thanksgiving dinner. Ask students to assume that everyone will eat one pound of Turkey, 8 oz. of ham, 2 rolls, 1 slice of pie or cake and 2 oz. of everything else. Ask students to add up the amount of people they are having to dinner. Now ask students to try to plan how much of each item they need to make to feed everyone at the dinner. Have students make ring napkin holders to set at the Thanksgiving dinner. They can be made out of construction paper and glue. Simply cut strips of construction paper so that they are all the same size (about 5 inches), then glue the ends together so that they form a circle around a napkin. Ask children to make three different styles and set them around the table in a pattern. This helps them to practice their pattern skills as well as their measuring skills. Practice grouping or pattern skills by helping your child to make Thanksgiving place mats. You will need clear contact paper, a measuring tape and scissors. Help your child to go out into the yard to collect leaves. Measure and cut the contact paper so that you have two pieces for every seat at the table and all the pieces are the same size. To practice grouping, have the children take the paper off of the back of the sheets of contact paper and arrange leaves of similar patterns on the contact paper. Then, take the paper off the back of another sheet of contact paper and lay it on top of the first one so that both sticky sides are facing each other. To practice making patterns, use the same method described above, but ask students to use different types of leaves to make a pattern on the contact paper. This can be in the form of arranging leaves in a specific design or not, but the leaves should alternate in a pattern. Use the turkey feather reward system to help students keep track of their progress on their math work. Follow the instructions below to create your turkey reward system. You will need 2 paper plates per student, about 12" of brown yarn per student, brown marker or paint, a variety of colors of construction paper, glue and markers. Give each student two paper plates with holes punched around the edges. Have students use yarn to "sew" the paper plates together. Allow students to paint or color the paper plates as the "body of the turkey. Ask students to cut a triangle 4" tall to use as the neck of the turkey, then another triangle about 1/2" tall to serve as the beak. After gluing the triangles onto the body, use a marker to color eyes on the turkey. Have students help you use the calendar to figure how many weeks there are until Thanksgiving. Have students cut the same amount of "feathers" out of construction paper as there are weeks until Thanksgiving. As they cut the feathers, make sure they fold the bottom part of the "feather" so that it can be stuck in between the paper plates using the gaps made by sewing the plates together. For every week that the students complete their math homework on time, they get to add a feather to their turkey. Use these turkeys to decorate the room for Thanksgiving. These math activities are a great way for students to get some "real life" experience with their math. This is also a great way to get them more involved with the holidays. What are your favorite Thanksgiving-themed lessons?